Just What the Heck is MOA and Why Should I Care? Look straight out, toward the horizon. Now look straight up. You don’t have to be a rocket surgeon or remember every word your geometry teacher said to know that the two spots you just looked at are about 90° apart. There’s a pretty big swath of the universe between those two points – roughly half of everything that the Earth isn’t blocking your view of. Now let’s pretend that you are looking down range at your blue target stand 100 yards away and it occupies, say, 1º of your field of view. There is an aerial view of this at right. Using the math that we all, of course, remember from trigonometry class, we can figure out that if the red line (distance to target stand) is 3600 inches (100y) and the brown angle (half of the portion of your field of view occupied by the target stand) is 0.5º, then the pink line (half the width of the target stand) is 31.41 inches wide (3600*tan 0.5º). Therefore, the blue target stand that occupies 1º of your field of view at 100 yards is 62.83 inches wide. Don’t worry, there won’t be a quiz on this part. So, why do we care about this and what does trig class have to do with shooting? Because most shooters have heard of MOA (minutes of arc, or minutes of angle) and some of them even have a basic idea of what it means or, at least, pretend to when clicking around the adjustment knobs on their scopes. One minute of arc is 1/60th of one degree. If your blue target stand at 100 yards in the diagram takes up 1º of your view, then it is 60 MOA wide. If you can keep all of your shots in a 63″ circle at 100 yards, you and your firearm are capable of 60 MOA shooting. Congratulations, dead-eye! This is only a rough example to demonstrate the basics of minutes of arc using numbers that are easy to work with and produce nice, round results. Any shooter who wishes to do better than hitting, literally, the broad side of a barn, is interested in much finer shooting increments. You don’t want to just hit the 63″ target stand; you want to hit the 1″ bull on it, right? We can back off from the trig now and do some simpler math. 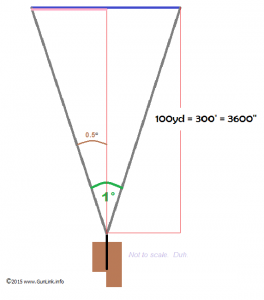 If your 62.83″ wide target stand at 100 yards is 60 MOA wide, then 1 MOA equals 1.047″ (62.83/60) at 100 yards. Shooters often just round this off to “1 MOA equals 1 inch at 100 yards.” Using this rounding will result in an error of 0.472″ at 1000 yards (where 1 MOA is actually 10.472″ instead of the approximate 10″). If a less than ½” change in your 1000 yard groups makes a difference to you, then you probably aren’t going to pick up any new shooting skills by reading this post. So if 1 MOA is 1″ at 100 yards, how many MOA is 2″ at 200 yards? It’s still 1 MOA. Minutes of arc is an angular measurement that gets bigger with distance. Think of it as a cone that comes out of the barrel of your firearm. If you have a rifle capable of 1 MOA accuracy (disregarding other factors like wind, bullet drop, etc. ), that rifle will keep shots in a 1″ group at 100 yards, 2″ groups at 200 yards, 10″ groups at 1000 yards, and so on. This is where this boring stuff starts to get a little bit interesting or, at a minimum, useful for the casual shooter. After all, you don’t want to be the person at the range trying to sight in that new rifle by adjusting the sights all willy-nilly, guessing at how far you need to move your point of impact to match up with your point of aim, do you? Any decent sight will have a known amount of movement per unit of adjustment. 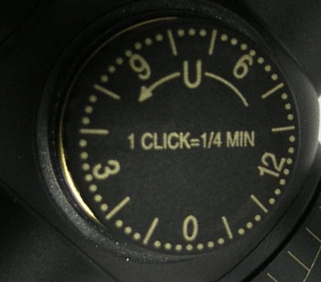 For instance, most scopes are marked with something like “1 click = ¼ MOA” or “1 click = ½ MOA.” If you know what distance your target is from you, how far your point of impact (POI) is from your point of aim (POA), and the increments of adjustment for your sight, you can quickly and easily adjust your sights with out a lot of guesswork and wasted ammo. 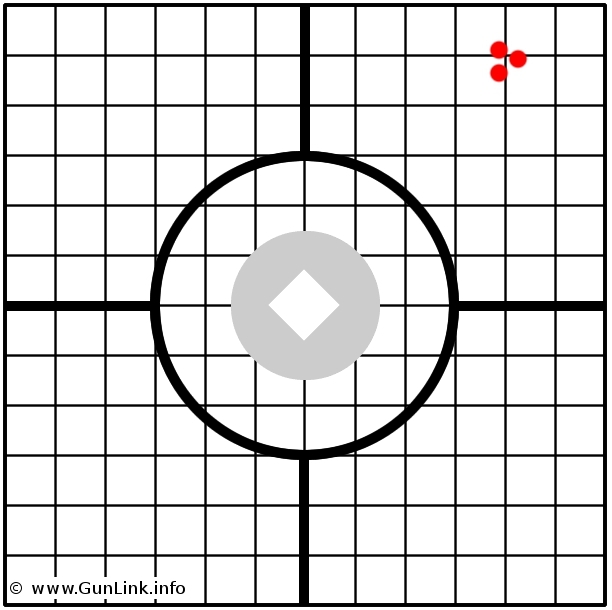 Let’s say that you shot a 3-round group at the example target above (assuming ½ squares) at 100 yards. Your group hit 2.5″ high and 2″ to the right of the bullseye. At 100 yards, this means that you need to move your point of aim to the left by 2 MOA and down by 2.5 MOA. If you have this scope with ¼ MOA adjustments per click, then adjusting your scope by 8 clicks to the left and 10 clicks down should bring your POA in to meet the POI and the next group should go right where you aim. 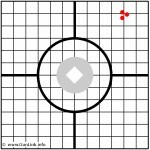 What would the necessary adjustments be if you had shot that group at 50 yards? At 200 yards? At 50 yards, 1 MOA equals ½”. So if you are off by 2″ to the right and high by 2.5″, then you will need to adjust left by 4 MOA (16 clicks) and down by 5 MOA (20 clicks). At 200 yards, 1 MOA equals 2 inches. Shooting this same sized group at a greater distance means that you are keeping a tighter group and less adjustment is required. At this distance, you are only off by 1 MOA (4 clicks) to the right and 1.25 MOA (5 clicks) high. Understanding MOA and how it translates into distance at various ranges and, thus, aiming adjustments, is an essential early step in basic marksmanship. Not only will it allow you to quickly zero your rifle (i.e., make POI = POA), it provides the basis for understanding the limitations of your equipment and yourself as a shooter as well as the foundation for more advanced shooting skills like adjusting for wind speed, bullet drop and various distances, and more. Put this knowledge and skills into practice next time you are at the range. To learn more basic rifle marksmanship skills, including more info about the “inches, minutes, clicks” of MOA, natural point of aim, breathing techniques, use of a sling, alternative shooting positions, and more – along with a healthy does of patriotism and American history – check out Project Appleseed and find an event in your area. 2 Responses to Just What the Heck is MOA and Why Should I Care?